KPCC/LAist has identified the third deputy fired by former Sheriff Jim McDonnell and rehired by Sheriff Alex Villanueva. The deputy is Jason Goss, and he was fired in March 2018, according to Sheriff's Department spokeswoman Nicole Nishida. Goss was reinstated in February through a settlement agreement, and is now assigned to the custody services division at Men's Central Jail, she said. Details regarding why Goss was fired - and what led to the decision to reinstate him — were not immediately available. Villanueva rehired three other deputies whose firings were overturned by the County Civil Service Commission. Sheriffs are bound by the Commission's decisions. The three deputies are Justin Seman, Omar Chavez and Brian Mayfield. Villanueva says he has ordered reviews of the cases of another 68 department personnel terminated by McDonnell. The 68 individuals' appeals have not yet been heard by the County Civil Service Commission, the sheriff said in a statement to KPCC/LAist. He said he has directed his division chiefs to "assess all of the related statements and evidence" in each case to see if the firings "can be sustained through the Civil Service Commission's hearing process." Approximately 70 more terminations are already on the Commission's docket, Villanueva said. 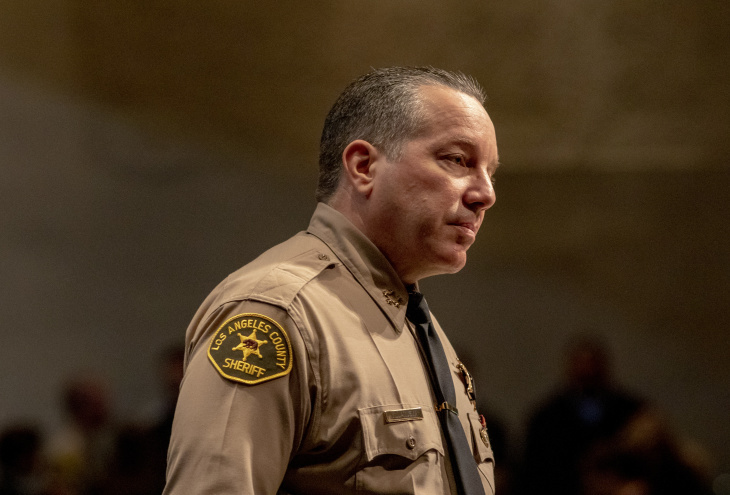 In an interview with KPCC/LAist Thursday, the sheriff said he will hold off on reviewing those cases until a court decides whether he has the authority to rehire deputies and other staff whose terminations are upheld by the Commission. Villanueva has said he believes McDonnell wrongly fired dozens of deputies. Besides Goss, Villanueva has rehired Deputy Caren Carl Mandoyan, who had been fired for alleged domestic abuse and lying about it to investigators. He also reinstated Deputy Michael Courtial, who McDonnell fired over his use of force during an arrest. Villanueva's Dec. 2018 rehiring of Mandoyan, who had been a key Villanueva campaign aide, has sparked the most controversy so far. The Civil Service Commission had upheld McDonnell's firing of Mandoyan. McDonnel fired Mandoyan after he was caught on videotape allegedly trying to break into the apartment of his former girlfriend, who at the time also worked for the sheriff's department. Villanueva had reportedly decided before he took office on Dec. 3 that he wanted to reinstate Mandoyan. After his swearing in, he appointed a "Truth and Reconciliation" panel to review Mandoyan's case; the panel concluded that Mandoyan should not have been fired, and the sheriff concurred. The Board of Supervisors filed a lawsuit last month challenging Villanueva's rehiring of Mandoyan. The next hearing in the lawsuit challenging Mandoyan's rehiring is set for June 26. Mandoyan has filed a lawsuit of his own against the board of supervisors, claiming its attempt to block his rehiring amounts to retaliation motivated in part by opposition to Villaneuva's election. The suit names the four supervisors who backed McDonnell against Villanueva. The other deputy Villanueva rehired was Michael Courtial, who had been fired over his use of force during a 2016 incident. He got his gun and badge back on Feb. 20. Courtial's termination stemmed from a July 2016 incident in Lancaster. By the time Courtial arrived at the scene, two other deputies were already dealing with a highly intoxicated man who refused to get out of someone else's truck. According to a memo from the L.A. County District Attorney's office, Courtial brushed past those deputies, kicked the truck, pulled the man out and punched him a dozen times while subduing and handcuffing him. The DA's review of the case concluded there was insufficient evidence to charge Courtial with assault or vandalism. The memor also noted the suspect, who had a blood alochol level of .209, was resisting the deputies and being "combative." At the same time, the DA's office found that Courtial's "unilateral and unnecessary property damage and initiation of force, while ultimately lawful, was unnecessary in the situation with which he was confronted." McDonnell fired Courtial on the grounds that he violated department policies regarding de-escalation and excessive force. Villanueva said in a statement that while the deputy's actions should have been "more in line" with the standards he expects, a review of the case found the deputy did not deserve to be fired. And Villanueva said he agree with that assessment. The sheriff told KPCC/LAist that he wasn't the one who called for a review of Courtial's case — it was the man who had served as McDonnell's chief of the north division, John Benedict. The decision to reinstate Courtial "was made by a combination of county counsel and my division chief from the north division, which is Chief Dennis Kneer," Villanueva said. "I played no part in this at all," added the sheriff. "I was told when it was done, 'By the way, this is what we did.'" KPCC/LAist was unable to reach Benedict for comment. Janice Hahn, the chair of the Board of Supervisors, criticized Villanueva on Thursday for putting Courtial back on the force. "Rehiring a deputy who was fired for excessive force sends a disturbing message — that this type of behavior is tolerated," she said. "This erodes the public's trust in those who are tasked with serving and protecting them. I hope this doesn't represent pattern and practice for this sheriff." On Friday, Supervisor Mark Ridley-Thomas issued a statement: "I assert that there is no upside to having the Sheriff's Department tarnished by reinstating deputies who are not fit to serve." 2:15 p.m., April 4, 2019: This article was updated with additional information from the District Attorney's office. 7:03 p.m., April 4, 2019: This article was updated with information from the interview with Sheriff Villanueva. 8:05 p.m., April 5, 2019: This article was updated with information about Jason Goss, the other rehirings and Villanueva's plans for handling other firings. This article originally published at 9 a.m.